The mining sector minnow Royalco Resources Ltd (ASX: RCO) is hoping its next cash flow will come from New Zealand gold production but the wait may be long. The company holds a royalty right to South Island gold projects on which it acquired the gold royalty right from Rio Tinto Ltd several years ago after that mining giant completed its departure from gold projects in the Reefton goldfield and at Sams Creek near Takaka. All these projects are held by OceanaGold Corporation but at Sams Creek Perth-based MOD Resources Ltd (ASX: MOD) earned 80% interest by taking the resource to more than 1 million ounces of gold before putting the project in deep ice so it could focus on its gold-silver plays in southern Africa. MOD was selling its equity in Sams Creek to aspiring ASX-float Condamine Resources Ltd and OceanaGold was agreeing to a deal on its equity, but Condamine failed to meet a contractual detail, and Sams Creek is looking for a new owner. However, at last year’s Diggers & Dealers Forum in Kalgoorlie disclosed it was moving to take up several Reefton goldfield properties that had been held by OceanaGold. However, that deal may now be in limbo with several proposed gold IPOs for the ASX failing to reach muster in the past three months. The Reefton field properties Condamine was hoping to take up are historic operations at Big River, Alexander River and Reefton South. Royalco’s last report in 2018 showed the company had an overriding royalty of 1% at Sams Creek and between 1% and 3% at Reefton, including the historic Blackwater mine at Waiuta on which OceanaGold recently struck an alliance with a private company, Tasman Gold, owned by former Evolution Resources executive Mark Le Messurier. However, while Royalco gained an healthy gold royalty income several years ago when OceanaGold ran the Globe-Progress mine, that income expired before that mine was mothballed. Royalco may be waiting a long time for a renewed gold royalty given the fact Condamine appears to be some time away from listing before ever achieving production, and New Zealand through its poor recent record on resource projects has the country low on international investors’ radar. Royalco is still trying to sell its minor equity in the Weeks Royalty from petroleum production in Bass Strait, not helped by the lower oil price and the fact this great Australian project is in its twilight years. 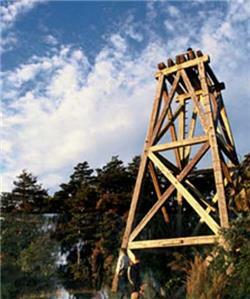 The historic mine headframe at Big River. Photo: Department of Conservation.